Carlington Booch: a local, traditionally brewed Kombucha social enterprise with a purpose. Carlington Booch was established as a way to bring community alive and create positive change, the same way the SCOBY does in the brewing process of Kombucha itself: creating something new, alive and good out of dormant, not-necessarily healthy ingredients unto themselves. We do this by donating a portion of each bottle sold to a local non-profit, charitable group that fights addiction and by bridging the gap (“booching the gap”) by providing service and employment opportunities within the addiction community. Only 3% of addicts in Canada get and remain sober. We want to be apart of changing that stat. 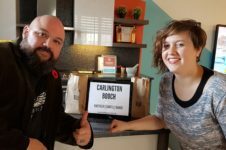 We want you to have a good gut feeling each time you purchase a Carlington Booch: both in making a difference in the lives of others but your physical gut will feel good too. We currently offer three flavours: Rootbeer, Ginger, and Naked. Each boast a ton of probiotics, vitamins, minerals, low-sugar content and natural carbonation, making our booch a healthy, delicious alternative to pop and soda. At Carlington Booch, we aren’t just in the Kombucha business, we’re in the renewal business.